A fascia board is technically part of the roof system of your house, but from the ground, it looks like part of the wall. Its purpose is to cover the ends of the roof rafters, and because that's where water drains off the roof, the gutters are often attached to it. The fascia board has to be resistant to moisture and rot, or it won't last long. A number of materials fit the bill. It makes sense to use wood for the fascia if your house has wood siding, but it's also a common material on houses with brick, stone or other types of siding. Cedar is a popular fascia wood and redwood is another. That's because both species resist rot and moisture very well, even when unpainted. If you prime and paint the fascia, you can also make them out of fir, spruce or pine, which are all less expensive. You construct fascia boards out of 1-inch lumber. 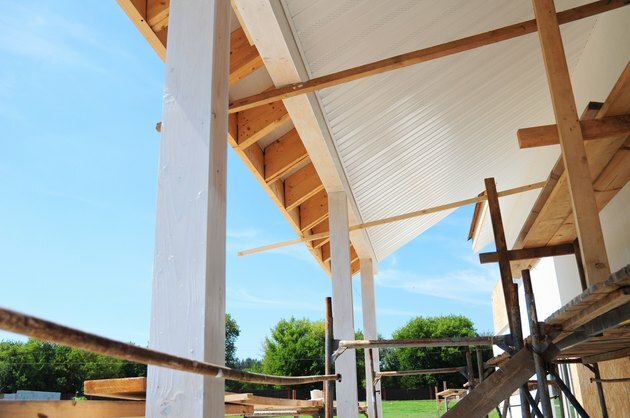 The width depends on the width of the rafters, but since builders generally use two-by-six or two-by-eight lumber for roof construction, the most common dimensions for fascia boards are one-by-six and one-by-eight inches. It's your choice whether to use rough-sawn or smooth lumber. A PVC fascia board is constructed to look like wood, even though it's made from the same material as plumbing pipes. It has a clear advantage over wood when it comes to rot resistance. It's most appropriate for houses with vinyl or aluminum siding, but it adds a clean touch to a house with wood, brick or stone siding as well. PVC fascia board comes in a variety of colors, and it's paintable. PVC expands more than wood, so pros usually glue the joints and use headed nails rather than finish nails to fasten them. If your house has fiber-cement siding, you'll probably want to trim it out with fiber-cement fascia boards. During installation, you can cut and fasten these boards as you do wooden boards, but cutting them raises dust and dulls saw blades quickly, so be prepared. Fiber-cement fascia boards come prepainted, but you can paint them any color you want. You can also buy composite fascia boards made from an amalgam of wood chips and plastic. They are manufactured by companies that make composite decking boards and are the best choice for trimming out decks made with composite materials. This type of fascia board isn't designed to be painted, so if you plan to use it for trimming out your house, choose the color carefully. If your house has vinyl or aluminum siding, you want the fascia to match. It's possible to buy vinyl fascia boards, but not aluminum ones. Either way, the most common strategy is to install wood fascia boards and cover them with vinyl or aluminum fascia covers. You nail them to the fascia, and they never have to be painted. They come in widths of 6 and 8 inches. The underside of the roof between the fascia and the wall is known as the soffit or eave, and it's common to cover this to keep out birds and small animals and to provide insulation. The types of fascia and soffit materials are similar, with PVC, vinyl and aluminum being popular choices. Many builders also use siding materials such as plywood for soffits. Even though plywood siding isn't a good fascia material, it works well for soffits, which are out of the rain and have to be painted and cut to install light fixtures and vents.